I feel like I say this every time, but I seriously love this brush! I love the thickness of the bristles and the angle it has on it. Even thought I only talk about applying a poly-coat in this particular video, I absolutely love using it for other applications too. It holds a lot of material which is perfect when you’re applying paint, stain or a top coat to a large surface. The last thing you want to do is “re-dip” in the middle of a paint stroke because doing that can result in unnecessary lines and mess up the smooth look you’re trying to achieve. The Chiseled Wedge is 2 inches in width and has a wedged-angle for perfect edging. It is great for details, trim, moldings and flat surfaces. The wooden handle is in the form of an hourglass so it fits well in your hand, which is a huge plus in my book! 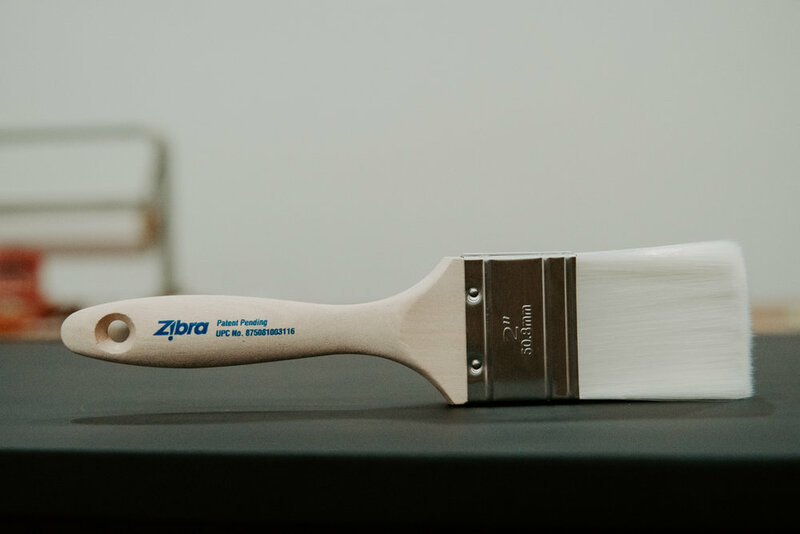 Each Zibra Brush is made with a smooth bristle technology unlike a conventional bristle brush. It can be used with all types of paint mediums and stains and you only need soap and water to clean it up (as long as you used a water based paint). The Zibra Chiseled Wedge Brush is a great price, too. For example, this brush typically costs somewhere between $12-15, which is pretty standard for a brush of any type, except the bristles don’t fall out on these and it leaves minimal brush marks! If you don’t have a Lowes or Home Depot where you live, you can purchase it through my affiliate link on Zibra’s website and have it sent to your doorstep! Thank you so much for stopping by for #TuesdayTipsWithFallon! Make sure you tune in each week for a new tip! If you want to save this blog post, just pin it to your Pinterest page and/or feel free to share it elsewhere. See you tomorrow for #WomenInBusinessWednesday!! Thanks again! Happy Painting!! *Please note, this blog post does contain affiliate links. Don’t forget to comment for a chance to win a free brush and t-shirt!! Make sure you check out my other #TuesdayTipsWithFallon videos and blog posts below! !